A new way to be productive, just by living your day. Easy. It’s no secret that our lives are getting busier than ever: lots to do and not enough time. There are plenty of books, studies, blogs, communities offering from small tips to sophisticated frameworks to help us manage our time better to become more productive and feel less stressed. I studied a lot of that material, absorbed the principles, put them in practice for myself. But if the original problem is lack of time, how many people, literally, have the time to do this? That’s why I decided to build with my team Kyber, a tool that incorporates those principles in an easy and intuitive way and guides you, just by using it, to put them in practice; a tool that helps everyone using it to get more efficient and feel accomplished instead of constantly overwhelmed. 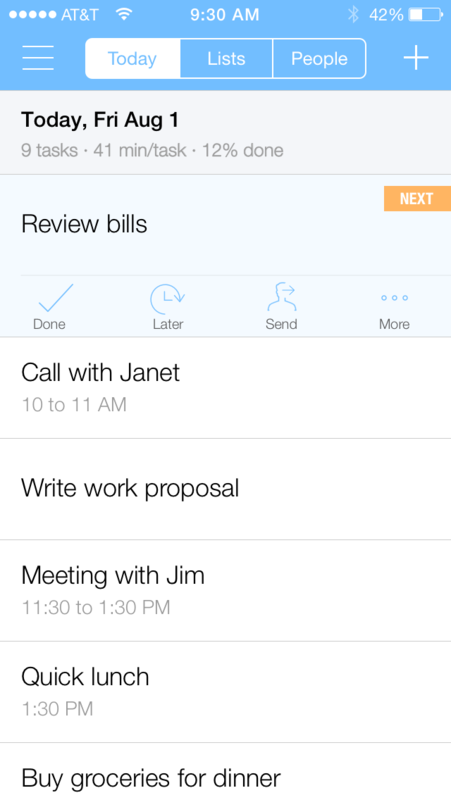 The concept around the app is remarkably simple: instead of letting you end up with an infinite and overwhelming list of tasks, we help you focus only on those you can realistically complete today; this is crucial as, first, it encourages you to choose the important tasks and, second, it makes you feel accomplished at the end of day as your task list will be most likely cleared. We made this process as simple for you as possible. After you decide to import your calendar events, we have a better understanding on how much time you really have free for the unscheduled tasks during the day; this one-time step also helps you having in a single place all your to-dos, reminders and calendar events: they are all just tasks you have to go through during your day, so why not having them in a single place for your convenience? Now that we know you are busy, let’s say, from 10-11 AM and from 11:30 AM to 1:30 PM, we start organizing the tasks you entered around those busy time slots and we also calculate how much time you have available, on average, for each task (41 minutes in the example below). If you have an average of 10 minutes to complete each task, it means that, probably, you have too much on your plate for today and it’s better to start “snoozing” some tasks with the ‘Later’ button: the task will now be moved to the ‘Upcoming’ section, out of your sights, but ready to come back to your today based on the snooze option you selected (Tomorrow, Next Week, etc). That average time per task also means that if you want to complete your daily plan, you will have to spend no more than that amount of time per task: pretty powerful metric you can use both as a goal and as a limit. 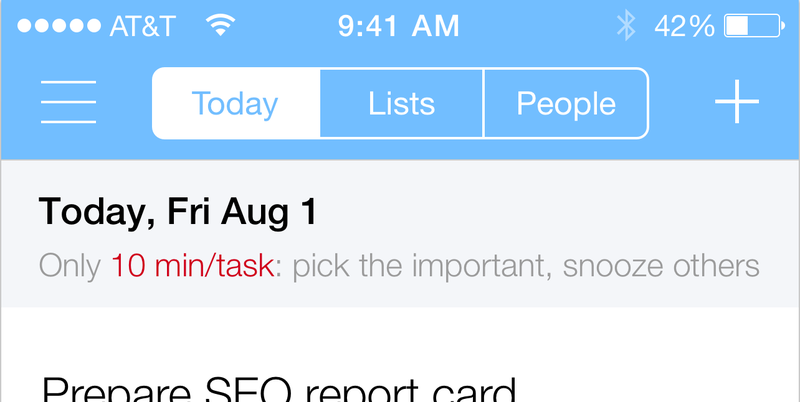 Based on when you open the app, the list intelligently self-adjusts as the day goes on, always suggesting what’s ‘Next’ for you to do (as per GTD best practices). This is again an important step: more than what we realize, we get blocked because understandably throughout the day we lose our concentration, maybe we try too much to multitask or simply because of external distractions. Going back to the app it’s an easy way to shift the focus back on what to tackle next, so you can keep your productivity rhythm high. Lastly, feeling accomplished is motivationally important. Every time you mark a task as ‘Done’, we first delight you with a joyful sound and then we show your daily progress as percentage completed. 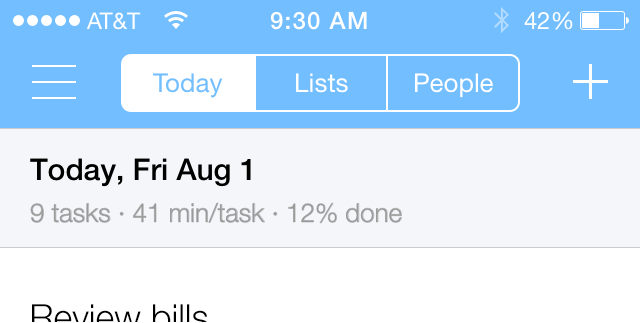 Keep checking the app during the day to see what’s next, so you keep the rhythm going and really get things done. If you don’t have it yet, download the app now. I’ll keep publishing my thoughts on how to get the most out of the app, how to seamlessly integrate it in your current workflows, and more importantly on how to make you incredibly productive and feel accomplished; feel free to subscribe below to get updates.